Whenever given the option for dessert the Bean picks marshmallows. It is the weirdest thing to me. She bypasses Popsicles and cookies and goes right to the marshmallow. So to honor her favorite dessert I thought we would try to make our own marshmallows. 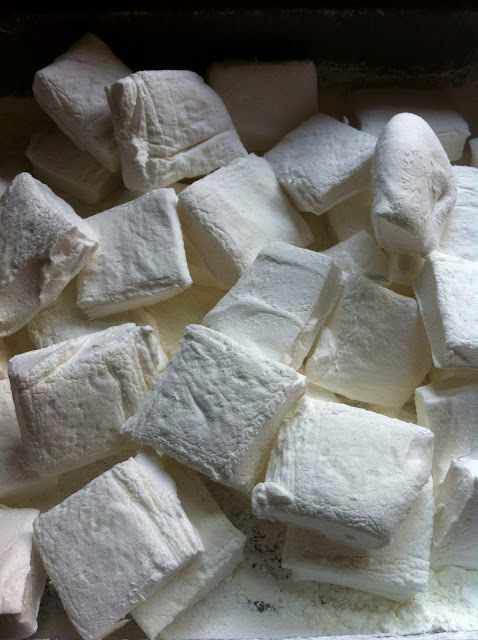 There are lots of marshmallow recipes on the Internet but one of the first I came across was this video. I have written before about how terrible I am at following recipes, mostly because I get excited and jump in without reading though first. The Bee and I watched this video twice and I think it was the reason the whole process went so smoothly. We started by taking a cake pan and oiling the bottom and sides of the pan. We then liberally sprinkled the pan with a mixture of cornstarch and powdered sugar. we used a sifter, which the girls loved and really thoroughly coated the pan. We then poured 3 1/2 packets of non-flavored gelatin into the bowl of the mixer with 1/2 cup of cold water and let it sit. At this point the Bean had lost interest and went to play for a while, and the Bee and I poured 1/2 cup of water, 1/4 teaspoon of kosher salt, 1 1/2 cups of granulated sugar and 1 cup of corn syrup into a sauce pot. I then stirred the ingredients together until they started to boil. The recipe says to use a candy thermometer and cook until 240 degree. Of course when I got ours out I discovered it was broken, so we just let the mixture boil for 10 minutes which seemed to work well. We then slowly poured the mixture into the mixing bowl with the gelatin. We turned the mixer on med-high and let it run for 12 minutes. During the last minute we added one teaspoon of vanilla. The girls loved watching the mixer go round and round and watching the marshmallow start to form. After the mix was done we carefully scraped the marshmallow mixture into the cake pan. One of the recipes I read said not to worry about scraping every last bit out, it gets very sticky and messy if you do. This was really good advice! I was able to scrape out plenty of marshmallow mix the first time without getting everything coated in marshmallow. I then gently spread the marshmallow out a little in the pan. We sifted on a little more powdered sugar/cornstarch on top, covered the pan with a dish towel and let them sit out overnight. 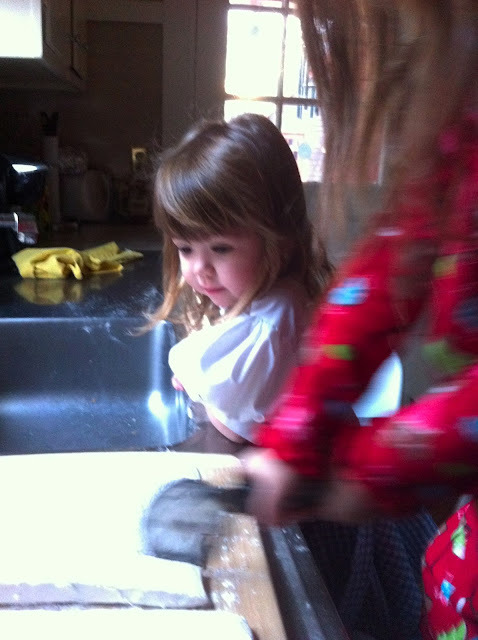 The next morning we carefully dumped the marshmallow out onto a cookie sheet. I think our over coating worked well and the marshmallow came out very easy. The girls then took turns using a cookie cutter to cut the marshmallow into squares. The recipe made lots and lots of marshmallows. We ate plenty and still had a bunch to send into work with my husband. The finished marshmallow were delicious. I personally thought they tasted better then store bought marshmallow. I don't think the girls agreed though. They liked them a lot but I think the flat, square shape for a marshmallow was a little weird to them. Although it didn't stop them from eating a few. I tried making them once and the marshmallow mix traveled all the way up my beaters as I mixed it. I couldn't keep it down! It even went past the beaters, up into the holes they insert in & was not easily cleaned. I don't think I'll be trying that one again until I have a Kitchen Aid (mine is a smaller, cheaper stand mixer). I made the regular flavor but they didn't take much different than store bought to me. I also made chocolate mint which was fun & more worth the effort, but now they carry so many flavors, I don't know! So funny that the girls were not that interested in eating them.